Flint meets his idol Chester V, who offers him a job in Live Corp, an invention corporation. Believing this will lead him to his big break, Flint starts his caffeine fuelled, highly competitive job with the company. Chester V discovers Flint’s food making machine is still churning out living food or ‘foodimals’. 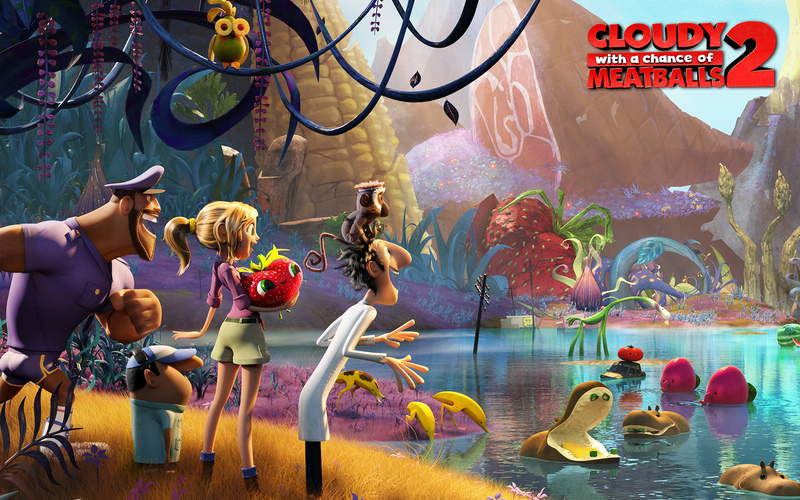 He orders Flint to travel to the island and destroy the device to save the world from a foodimal invasion. Though it’s targeted for kids, big kids will love this film too. It’s even got subtle adult humour, “she wants you to scratch her buns” (yes, it is an actual line). And of course, there’s the uniquely named “BS USB” that is given to Finn to destroy his food making machine. Obviously any food-related animated picture would need a million and one puns. This film is full of it. So if you have a particular dislike for cringy food puns, maybe this isn’t for you. It doesn’t drag on though and ends at the 95 minute mark. Even if you didn’t see the first one it’s easy to follow as there’s a quick recap at the start of the film. Also the soundtrack is rather cool. It’s not expected to be as popular as its predecessor, which was a $243 million worldwide box office success . The group at Sony Pictures Animation can only hope that the sequel will piggy back on the first film’s success.